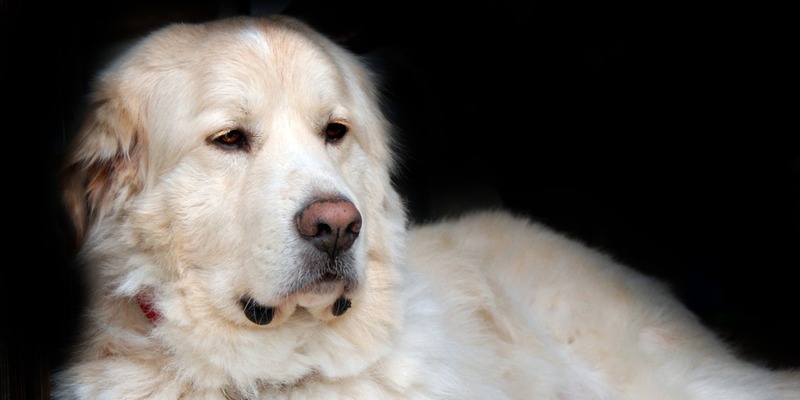 The Great Pyrenees is a long haired animal that has a very thick coat. Coat colors are mostly white, sometimes with gray markings. Coats can also have red or tan masking on the head and tail. The nose and eye rims are jet black. The coat requires consistent maintenance to keep under control. Daily brushing to combat shedding and mats is necessary. Great Pyrenees will “blow their coats” once or twice a year. The Great Pyrenees is a protector by nature. Bred and raised to be a protector of livestock, they have a very independent way of thinking, not needing direction by man. They are often known as very stubborn because they are free thinkers. If they are not leashed they will almost always will roam as it’s instinct to see what danger is near that they may have to fend off for the sake of their protected livestock. These animals do bark a lot as it is bred into them to alert potential predators of the livestock of their presence, especially at dusk. Because of their barking nature, Pyrs make great watch dogs. Great Pyrenees are wonderful with children as a friend and protector, however great caution should be used with children at feeding time. Often the Pyrenees are used to protect goats and the goats will steal the dog’s food, so a snap is issued to put the goats in their place. In the case of children, the children are the dog’s “goats” and the Pyrenees will treat them as such. If two Pyrenees are present they are able to fend off an entire pack of wolves as they will instinctively stand back to back so neither dog can be surrounded by the wolves. Great Pyrenees love walks so they can explore as their instinct tells them they should do. Never allow your Pyrenees to be off-leash no matter how much you trust him/her. It is instinct for them to run and at some point they will roam, if allowed.